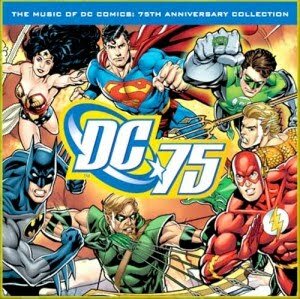 The classic Batman tv theme, together with 30 more DC superhero themes, has just been released on dc! The collection, which hits stores later this year, is a must-buy for any fan of DC Comics and it’s various television, film and cartoon interpretations. Scroll down for the track listing and album art. -Previously unavailable. Digitally remastered. From the Academy Award Nominated cartoon series “Superman” produced by Max Fleischer. This was the first Superman cartoon. - From the live-action film “Superman.” Digitally remastered. - From the live-action TV Series “Lois and Clark”. Digitally remastered. - Previously unavailable. Digitally remastered. From the live-action serial “The Batman.” This was the first filmed appearance of Batman. - From the live-action film “Batman”. Digitally remastered. -From the live-action TV series “Batman”. Digitally remastered. -From the cartoon “Batman: The Brave and the Bold”. Digitally remastered. -From the cartoon “Batman Beyond”. Digitally remastered. -From the live-action film “Batman Begins”. Digitally remastered. -From the animated movie “Green Lantern: First Flight.” Digitally remastered. -From the animated movie “Wonder Woman.” Digitally remastered. -From the live-action TV series “Wonder Woman.” Digitally remastered.